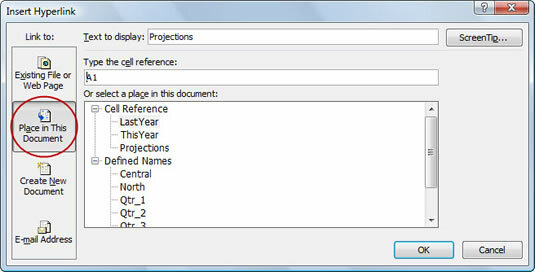 You can insert a hyperlink in Excel 2007 that anyone can click to jump to a different cell in the current workbook. The hyperlink can appear in a worksheet cell, or it can be associated with a graphic object, such as a shape or clip art object. 1Select a cell or graphic to which you want to attach a hyperlink. You can assign the same hyperlink to multiple selected cells. 2Click the Hyperlink button in the Links group on the Insert tab (or press Ctrl+K). The Insert Hyperlink dialog box appears. 3If you clicked a blank cell in Step 1, you can type the text you want the cell to display in the Text to Display box. If you started with a cell that already contained data, you can change the displayed text. If you selected multiple cells, only the data in the first cell will be changed. 4On the left, click the Place in This Document button. 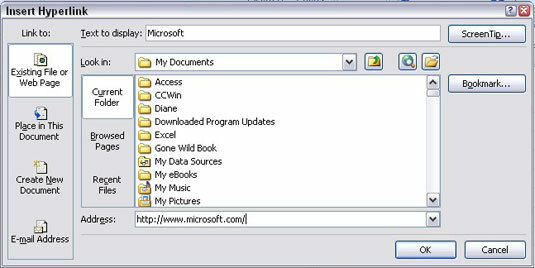 The dialog box changes to give you options specific to within-workbook navigation. 5Select or enter the hyperlink's destination. Enter the cell address (such as B12) in the Type the Cell Reference box and select the worksheet that contains that cell reference you want to jump to. 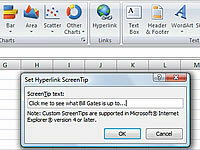 6(Optional) Click the ScreenTip button to the right of the Text to Display box to enter ScreenTip text. 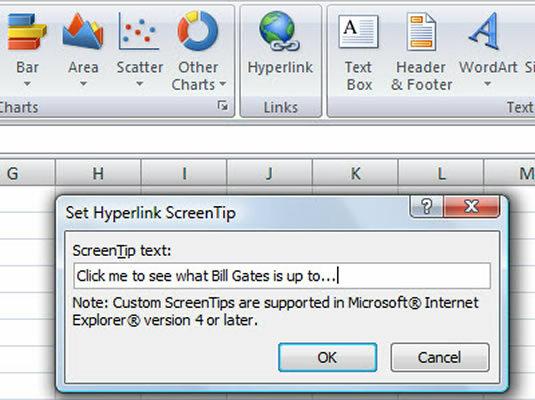 The ScreenTip text will appear when a user hovers the mouse cursor over the hyperlink. If you started with values in a cell, those values will appear underlined and in blue, indicating an active hyperlink.